We are looking for 10 new Robins to help us! As you all know there are still thousands of displaced people stuck in Greece. The most affected are often those from less socially accepted groups. One man has set up a project to tackle this. His mission is to accompany these people in their everyday lives and give them hope. Like a social worker, Valentino personally supporting ten vulnerable people in Thessaloniki, regardless of their heritage, gender or religion. The deal is simple. The ten participants commit themselves to act and work in a project (warehouse, kitchen, workshop, translation etc.) and in exchange, they get a monthly bus card and credit to top up their phones. This adds a sense of purpose and value back in to their lives, providing new experiences and encounters. Valentino is someone who is a constant and is there to help them through the ever changing and sometimes chaotic system. To efficiently support the project we are now looking for 10 persons which are willing to donate 50 € monthly and therefore become a “Robin” for one of the individuals. The project is running continuously since mid May 2017, coordinated by Valentino. As the summer comes to an end I enter my 11th month here in Northern Greece. Everyday, people continue to arrive on the Aegean islands of Greece, but the likelihood of travelling on to another European country has reduced to become almost impossible. I can see the impact of the increasingly closed borders clearly in my work. Only one person who we support in the “Pame” project still has the chance to travel beyond Greece. Everyone else with whom I work who applied for relocation was refused by other countries in Europe, like Switzerland, like Sweden. European laws and closed borders mean they have to apply for asylum here in Greece. Mohamed fled the civil war in Syria while a minor, and came to Europe. His hope was only for a new start, to live in security and safety. But arriving in Greece he was confronted with the strict, uncompassionate, inhuman European migrant policy. At first he was denied access to the “relocation program” which allowed (predominantly) Syrian refugees to travel on to a different European country. Mohamed appealed and he was permitted to apply, and yet his application led to months of waiting, of continued uncertainty about his future, and the end result was rejection by Switzerland. We cannot possibly imagine what that rejection must feel like for a teenager, having fled his country, civil war, his family, and fleeing to the unknown in hopes of safety. The disappointment and subsequent fear and sorrow that such an asylum rejection engenders must feel unbearable. Unfortunately this result is the reality for Mohamed, and for so many like him when they leave their countries in search of safety, asylum, and protection. Mohamed in front of the Tamam Community Center in Sindos. Despite this, Mohamed hasn’t lost his calm, positive, and resilient attitude. He is finding ways to distract himself and stay occupied while working at Tamam Community Center in Sindos, and was also an active team member in our Lampetia project as an interpreter and mediator/facilitator. One month ago he received asylum in Greece, and he remains a participant of the “Pame” project for the time being. What does this mean for the “Pame” project? The individuals in our “Pame” program need support to have a better chance to build a new life of safety and a sense of normalcy in a foreign country. The international community, the EU, the Greek state, and organisations like the UN are helping on a very limited basis, but huge gaps remain. That’s why organisations such as “ Be a Robin” and other grassroots groups formed in order to fill these gaps. 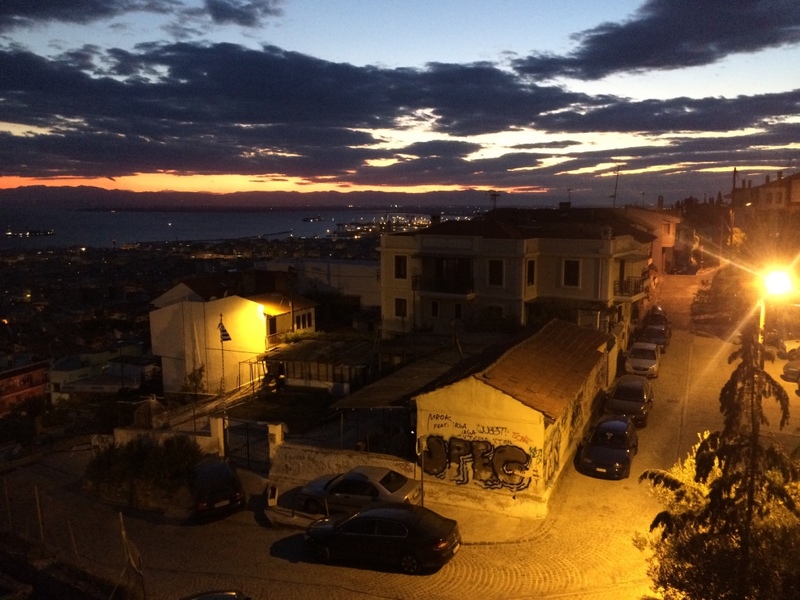 A lot of people arriving to Thessaloniki are forced to live rough on the streets of the city. My program does its best to respond to their need. Many need a constant figure of support in their lives, someone on whom they can count, someone who can offer advice, someone who can connect them to opportunities and resources, someone who has time to sit with them, listen, and share humanity. To give these people a fair chance I plan to use more financial resources to support their education and to improve their quality of living. My hope is that this will enhance their prospect to start a new life here in Greece. My home for now, Thessaloniki mou! For now, I will stay here in Thessaloniki as coordinator of the project, and continue to adapt and improve it. To do this, I also need you! I ask you to continue your funding, or to start now. We cannot all leave our lives behind to be here in Greece; you are the Robins close and far whose support sends love and hope to all the people in our projects. Thank you.